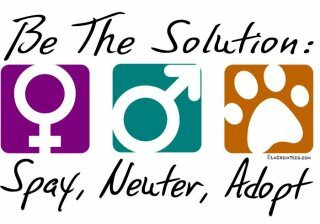 ASK TO BE PUT ON THE WAITING LIST..
Spay/Neuters are limited to 25 animals very 6 to 8 weeks. If there is space available after scheduling our Rescue animals, we will offer the remaining spaces to qualifying Families. If you would like to get on our waiting list please submit a registration form available on the "Applications and Forms" link above. At our Spay Day Events we also have a Low Cost Vaccination Clinic. These are walk in clinics between 3pm and 5pm, no appointment needed. Please note: If your pet is in need of a 3 year Rabies Vaccination, A copy of their current Rabies Certification is required. If the Veterinarian does not see proof of current rabies she can only give a one year rabies vaccination.